* readwritethink.org has THIS lesson comparing book choice to Goldilocks. * BrainPopJr has THIS video and lesson suggestions. * Jo Nase, The Book Bug, wrote THIS great post about using Goldie Socks and the Three Libearians. She has some great freebies to go with the book! * Scholastic promotes the PICK strategy in THIS article. * The 2 Sisters uses shoes as the foundation for their discussion. Over the years, I have tried several of these strategies. I compared book choice to Goldilocks, but the kids seemed too focused on Goldilocks and her porridge. I created a PPT describing the IPICK method, but I seriously lost the second and third graders part way through that. I knew that I needed something different. Thus the birth of "If the Book Fits ... Read It"
Now ask kids to think about what makes a pair of shoes "Just Right." What do they take into consideration when choosing shoes? Lead students to realize that there is generally more than one criteria. The same thing goes for books. We need to keep several different criteria in mind when choosing a "Just Right" book. Introduce the acronym PICK for both shoes and books. This is NOT the usual acronym that you see with Just Right Books, but my very own version. "P" is for Purpose. "I" is for Interest. "C" is for Comfort, and "K" is for Keeper. Be sure that kids know what these words mean in general. Continue the lesson by comparing shoes and books. Show pictures of shoes that have specific purposes: i.e - ballet slippers, rain boats, and scuba flippers. 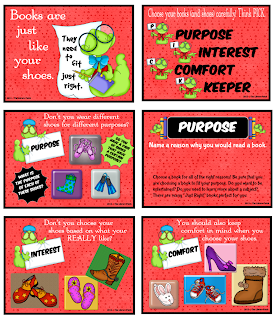 Ask students to share how each pair of shoes is used. Ask them if they have a certain pair of shoes for a certain purpose at home. Then, initiate a discussion on why kids read books. Be sure that students mention both entertaining and informational purposes. Further discuss how the purpose for reading influences the types of books that you might choose. Ask kids if they have ever been shopping with a grown-up for shoes. Does the grown-up always agree with them about the shoes that they like? Does the grown-up want you to try on a pair of shoes that you don't like? Lead the discussion towards the idea that everybody likes different things. What interests one person doesn't interest everybody! I show pictures of flip-flops, cowboy boots, and clown shoes. Then I discuss that I really only like one pair of these shoes. I don't mind if someone else wears cowboy boots; they look great on some people. They just aren't for me! Further explain that books are EXACTLY the same way. Certain people love certain books, but they may not be "just right" for everybody. I then give the kids the following tips for finding books that interest them. 1. Look at the front cover. I talk about both the quote, "Don't judge a book by its cover." AND "A picture is worth a thousand words." 2. Read the blurb on the back. This short summary will help a reader get the gist of the story. 3. Flip through the pages. Pay attention to the size of the text and illustrations. 4. Think about whether you have enjoyed this series, subject, or author before. Both books and shoes should be comfortable. Ask students what makes a pair of shoes comfortable. Then, I show the kids a picture of bunny slippers and explain that there isn't anything as awesome as your favorite comfy slippers. However, I then pose the question of whether I should wear my slippers everywhere. There is usually instant laughter. What a perfect opportunity to talk to kids about that favorite book of theirs! We all know those kids that choose the same book EVERY time they come to the library. Yes, it's comfortable, but you can't read it all the time. Now show pictures of sneakers or another pair of comfortable shoes. These are perfect for wearing all day! Then, show a picture of a pair of high-heeled shoes! Explain that these shoes sure look good ... at least on me! But, that I can only wear them for a short period of time. They pinch, and rub, and hurt my feet. They aren't good for the long haul. Pose the question to the kids, "If books were like shoes, which pair should we be reading most of the time." Follow up by asking students what makes a book comfortable. Then introduce, or reinforce, the Five Finger Rule. 0-1 Fingers: Too easy ... Like the bunny slippers! Nothing wrong with a little cozy and comfy, but we shouldn't read it ALL the time. 2-3 Fingers: Just right ... Like a pair of sneakers. Books that are just right are best for reading. They are comfortable enough to stick with for a little while. 4-5 Fingers: Too hard ... Like a pair of high heeled shoes or new dress shoes. Challenging can be TOTALLY worth it ... if you LOVE the book, but it won't always be comfortable. I think that the Five Finger Rule is a great tool to teach kids. It can help them to be more independent and reflective in their book choice, but I believe that it should be taught as a guide only. If a student is genuinely passionate about a subject, series, or title, and the text is deemed too hard, they should have the opportunity to try to wrestle with it! I think that once a student chooses a book, they need to consider whether that book is a keeper. There are too many books in this world to stick with one that is not interesting! That is not to say that we don't need to "encourage" kids to give a book a chance or get heavy-handed with those perpetual book bouncers, but more that sometimes we DO pick books that aren't "just right" for us! It's okay to not finish a book. A kid who doesn't like reading simply hasn't found the right book yet. Kids need to ask themselves the following questions as they begin reading a book. 1) Has the story hooked you? caught your attention? 2) Do you understand the story? 3) Can you tell a friend about the setting, main character, or problems in the story? 4) Would you recommend this book to a friend? or read another book by this author? Well, there you go ... a unique way to tie together the Five Finger Rule and the I PICK strategy! My kids have really been able to relate to the shoe/book connection, and it has been great fun to present it in this way! A huge "Thank you" to Annie Lang at http://anniethingspossible.com for the wicked cute bookworm clipart! 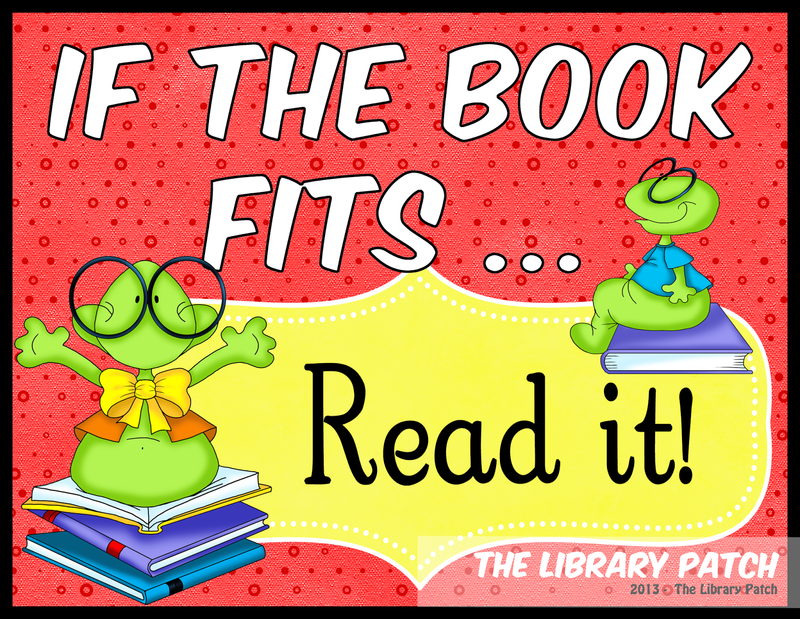 I have outlined my "If the Book Fits ... Read It" lesson plan here for you. If you are interested in purchasing the Powerpoint presentation of this lesson, head on over to my TpT store by clicking on the pix below!